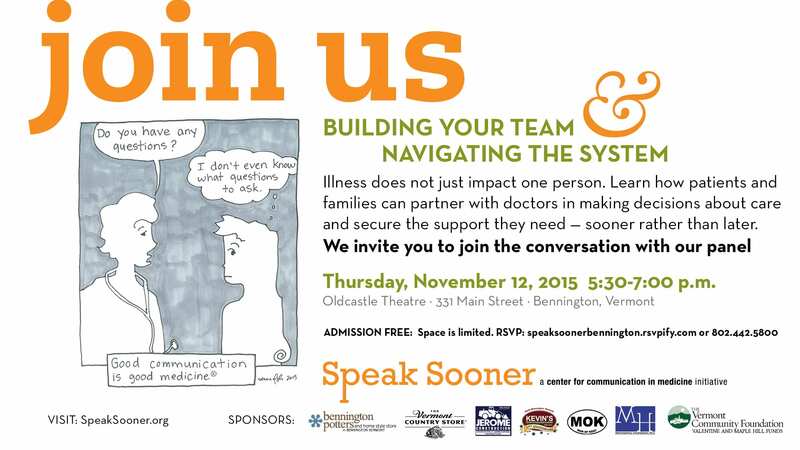 On Thursday, November 12, 2015, the Center for Communication in Medicine held a community program at Oldcastle Theater in Bennington, VT. The program, “SpeakSooner: Building Your Team & Navigating the System” was offered to help improve communication between patients and their families, friends and healthcare providers. Over 120 people attended! Read More . The first in a series of SpeakSooner community education programs offered in Bennington by the Center for Communication in Medicine, the evening included video of patients sharing their first hand experiences, a panel discussion and a question-and-answer segment. On the panel were Jan Martin Bopp, patient/patient-advocate; Rose-Marie Pelletier, caregiver; Dr. Orion Howard, medical oncologist; Dr. Allen Hutcheson, palliative care physician; Dr. John Hearst, primary care physician; and Celia Engel Bandman, medical humanist. Dr. Bernard Bandman as moderator. Recognizing that illness does not impact just one person, the SpeakSooner initiative is committed to getting patients living with serious illness, their families, friends and healthcare providers on the same page through timely, open and honest conversations about treatment options, quality-of-life considerations and needed supports, respectful of one’s values and goals. Through the generosity of sponsors, all attendees received a complimentary copy of the Difficult Conversations Toolkit. When I receive the letter, I do not recognize the return address on the envelope, but “MD” alerts me it is from a physician.